Mugsy's Rap Sheet » The Big Lie: ONLY Conservative Groups Targeted by IRS? That’s not true. Last week, the GOP unveiled its latest stalking horse: the idea that someone in the White House ordered city-level IRS offices across the country to single out “Conservative” organizations seeking “tax-exempt status” for additional scrutiny. And not just ANY “Conservative” groups, but “T.E.A. Party” groups. Set aside for a moment the fact that for YEARS the Tea Party has denied being a Republican or even “partisan” organization, as far as “scandals” go, this one is pretty weak tea (pun intended). To buy into this absurd conspiracy theory, one must believe that the White House decided that delaying the approval of “501(c)(4) status” for Conservative groups (because remember, despite “targeting” them, they APPROVED their applications anyway) was a priority worth risking criminal prosecution and possible impeachment for “abuse of power” 18-months before President Obama even began his reelection campaign. Hearings in the House last week revealed that this was little more than a bureaucratic snafu of overworked local IRS staffers looking for “shortcuts” to process a flood of Conservative groups seeking “tax-exempt” status in the wake of the “Citizens United” decision. Republicans could already feel the issue slipping away last week as polls showed the President not losing any ground over the issue. So over the weekend, Republicans started to declare that “ONLY Conservative groups were TARGETED by the IRS”. Why? Because if “ONLY” Conservative groups were targeted, that must mean someone consciously singled them out because of their political beliefs. And “targeted” sounds much more malicious than “singled out”. Problem (for them) is, IT’S NOT TRUE. It’s an absolute total lie. Plenty of “Liberal” groups received the same additional scrutiny, and in one case, was actually denied their application for 501(c)(4) status (unlike EVERY. SINGLE. CONSERVATIVE group, who were ALL approved.) Yet they are making the claim everywhere (even the floor of the Senate) without anyone calling them out for lying, hoping to push the false narrative that something dastardly was afoot at the IRS… an organization Republicans have been vilifying for decades. “Liberal” groups applying for tax exempt status also received additional scrutiny, but not as many were scrutinized as “Conservative” groups only because far fewer of them applied. But first, some background: in 2011 following the Citizens United decision, the IRS did indeed start cracking down on “political” organizations seeking 501(c)(4) protection as a way to illegally conceal their donors. That’s the “fraud and abuse” portion of the “waste, fraud and abuse” Republicans say they’re always on the lookout for. One of those “tax loopholes” Mitt Romney suggested we close before we raise anyone’s taxes. The 2010 incident involved an offhand comment by the White House economist Austan Goolsbee that Koch Industries had not paid corporate income taxes because it pays taxes through the personal income tax code. As it turned out, that was not true, but the assertion was made in a discussion of tax reform ideas, not politics. So that “confidential tax information” wasn’t even real. It was one guy repeating something he had “heard”… NOT “factual tax information” provided to him by the IRS. [One must believe that IRS targeting] “JUST HAPPENED to fall disproportionately on Conservatives” [without malice or forethought]. Yes George. Conservative Groups did indeed “just happen” to receive a disproportionate amount of scrutiny because a disproportionate amount of APPLICANTS were Conservative. Something to consider: If you were going to comb through 70,000 applications (Cincinnati in just one year) for “tax free status” and wanted to target “Liberal” groups specifically in your brute-force search of political organizations masquerading as charities, what keywords would you choose? Words like “Liberal” or “Progressive” to be sure. Maybe “Democratic” too though “Democracy” is no sure thing. But what else? What other Liberal “political” keyword might you include in your search to “target” Progressive groups? If you can think of even one more, you’re a better man than I am, Charlie Brown. But when it comes to Right-leaning groups, besides “Conservative” or “Republican” there’s “Tea Party”, “Patriot(s)”, “Militia”, “(fair, flat) Tax (fairness, etc)” … heck, I think even “Freedom” has been co-opted by The Right as their own personal brand. And in the immediate aftermath of the “Citizens United” decision, Conservatives were applying for “tax exempt status” en masse because… not only do they despise paying taxes (read: paying for the government services they use), but 501(c)(4)’s are not required by law to disclose their contributors, allowing them to operate in total secrecy… just the way Karl Rove (et al) likes it. So is it any wonder Conservative groups were so easily caught up in the drag-net (and I use that term almost literally.) These local under-staffed IRS offices used a quick & dirty search using obvious political keywords to filter the “suspicious” applicants from the genuine ones. And being dragged into this Dog & Pony Show is ObamaCare via “Sarah Hall Ingraham”. If you’ve never heard of her before now, you are forgiven. She was the evil genius in charge of overseeing just who did & did not qualify for “tax exempt status” when this “scandal” was taking place (2009-2012). That would be the same evil genius that “targeted” Conservative groups only to then go ahead and give them 501(c)(4) status anyway. Ingraham is now the director of the IRS’ Affordable Care Act office… basically, the person tasked with “enforcing” the insurance mandate with absolutely no power to actually do so. So naturally, Republicans are freaking out because… well… I’m not exactly sure. Why do Republicans ever freak out? Do they think she’ll only enforce the Federal mandate against Conservatives (read: whites) and let everyone else (read: blacks/Mexicans) slide? Because if the current IRS “scandal” is any indication, the people most likely to skate are Conservatives. Do they believe she’s incompetent? Then they should be thrilled that someone was appointed to the job that could take down ObamaCare for them. CLEARLY they aren’t worried that she’s SO competent that she’ll make ObamaCare a roaring success. So what’s their problem? There’s just no pleasing these people. 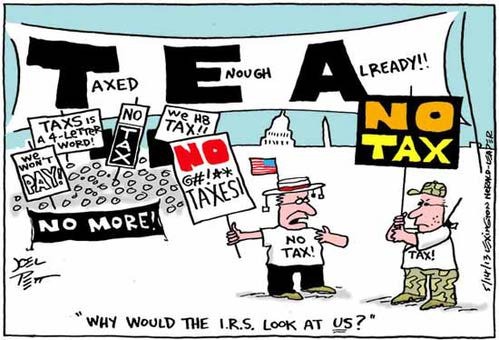 Personally, the REAL IRS “scandal” is that ANY political group has received tax-exempt status. Who “targets” an entire group of people for additional scrutiny and then goes ahead and approves them anyway? WORST. SCANDAL. EVER. With all the complaints that the government is “getting too large”, just the opposite has happened at the IRS. They have been cut from 115,000 employees to 89,000 after a 17% cut in funding with even more cuts coming from the sequester which will furlough every IRS employee five more days this year. Yet, thanks to Citizens United there has been an avalanche of new applicants with the 115 employees in the Cincinnati office left in charge of verifying that these new organizations are indeed “charitable” (you know like the Red Cross, American Cancer Society, your local Baptist church…!). With the name “PARTY” in your group title, are we to believe that you are providing food, clothing, medicine, and housing for the poor? What is so charitable about having millions of anonymous TAX-FREE contributions in order to run negative ads against political foes? Well, I guess you could say the Supreme Court ruling has been charitable to big MEDIA raking in advertising bucks.